Lynn Roth '99 is director of information technology with Solana, a Ohio company that provides business management software and related IT support services for agencies that serve people with intellectual and developmental disabilities. When asked what he does in his spare time, Lynn Roth ’99 mentions his 3D printer, home built with the help of open source plans. He’s printed “doodads,” his catch-all word for a variety of objects to replace, repair or decorate things around the house for his wife, Anita, and a horse or two, as well as some carriage wheels, for his equine-crazy daughters, Kate and Leah. Solana serves more than 130 providers in 23 states (one of its Virginia-based customers is Pleasant View home in Broadway, a ministry of the Virginia Mennonite Conference). The company is owned by Sunshine (formerly Sunshine Children’s Home), a non-profit, faith-based service provider for the developmentally disabled in northwest Ohio. The company was started in 1997 by Lynn Miller, a Hesston and Goshen graduate who developed the ProviderPro software that is the basis of the company’s line. A constant challenge for Solana’s clients is managing data specific to their needs, ranging from the usual business basics such as human resources and payroll, to more specific tracking of billing information, fundraising, client demographics and incident reports. 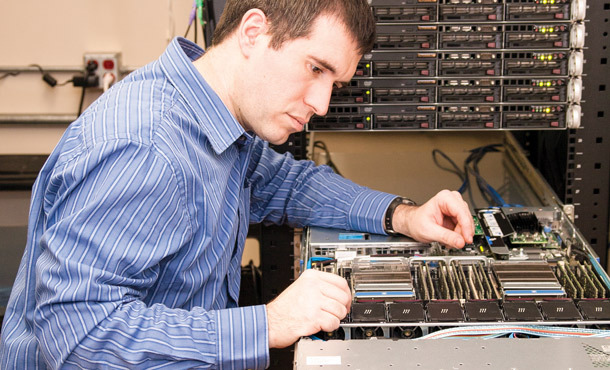 Recently, Roth has led the implementation of a virtualized data center that allows for upgrading hardware and handling hardware failure with little or no downtime, and a secondary data center that would function if the Wauseon site experienced a major disaster. He’s also helped design single-page web applications that “work on any device from a phone, tablet, or PC with a load balanced back-end” to accommodate new growth. “We’re always developing new products or improving older products, designing new things and looking ahead to technologies we want to work on in the next few years,” Roth said, in a statement that encapsulates his creative and technical endeavors, from software to 3D carriage wheels.